"Unlike most of America's other favorite fast foods, falafel is rarely attempted at home, which is a shame, since it's very simple to do, and even a relative novice like me can get some very decent results. One word of warning: you do need to know you're going to have a craving for this a full day before you actually want to eat it." Place garbanzo beans into a large container and cover with several inches of cool water; let stand 12 to 24 hours. Drain. Blend garbanzo beans, onion, parsley, garlic, flour, lemon juice, salt, cumin, coriander, baking soda, and cayenne pepper together in a food processor, scraping down the sides of the bowl as necessary, until mixture is finely ground and holds together when pressed. Transfer garbanzo mixture to a bowl, cover with plastic wrap, and refrigerate until flavors blend, 1 to 2 hours. Divide dough into 12 portions and roll each with moistened hands into a ball. Working in batches, cook falafel balls in hot oil until browned and crispy, about 5 minutes. Transfer to a wire rack to drain. 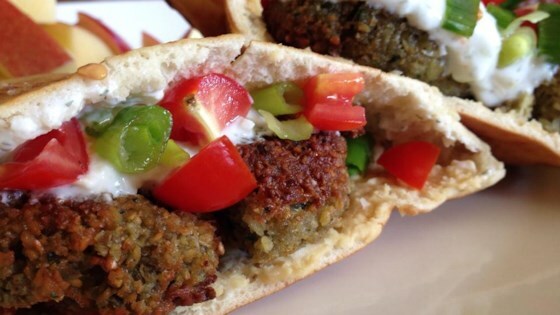 Try this crisp, tender, all around yummy recipe for falafel! Serve with Chef John's Tahini Sauce. We thought they turned out even better than the local Mediterranean restraunt. We are placing this on our go-to list. Try the sauce too...delicious.